Goldman Sachs is a giant pig. A giant pig that blows bubbles through a wand shaped like a dollar sign. A giant pig that laughs at us when we invest in worthless dot.com stocks. A giant pig that happily watches us get carried away and burned by rising home prices. A giant pig that smiles widely when we have to fill our tanks with $4.00 a gallon gas. Quite simply, the investment bank that is revered on Wall Street could just be a bunch of crooks, and greedy ones at that. 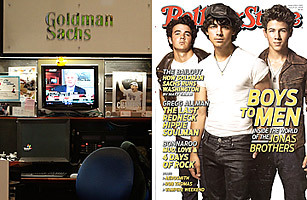 That’s the view of Goldman Sachs delivered by an article in the current issue of Rolling Stone. The rock mag’s The Great American Bubble Machine by Matt Taibbi says that the investment bank is responsible for creating, and in many cases popping, every great bubble of the nearly the past 100 years in order to profit from them at our expenseand the article uses plenty of illustrations of pigs to drive home what it thinks of Goldman. Taibbi calls the U.S. a “gangster state, running on gangster economics.” He says we have an economy where “some of us have to play by the rules, while others get a note from the principal excusing them from homework ’til the end of time.” And by “others” and “gangsters,” Taibbi means the bankers of Goldman Sachs. See 25 people to blame for the financial crisis. It’s great stuff. And it’s the kind of stuff you want to read at a time when we are still smarting from the one-two combo of housing bubble and credit crunch. Unless, of course, you are Goldman Sachs . Moore is right that the rock mag’s piece contains a bit of exaggerating and a whole lot of hyperbole. But to call it not real journalism or lacking substance is wrong. There are plenty of facts to back up the case that Goldman generates large profits by taking advantage of others. Goldman is the only Wall Street firm so far to have paid to settle charges$60 million to the state of Massachusettsfor creating the rotten mortgage bonds that were at the heart of the recent financial crisis. And get this: contained in Goldman’s client form is this disclaimer, “You acknowledge that we may monitor your use of the Services for our own purposes .” The firm seems to be announcing out loud that it plans to trade against its clients. Goldman responds that this type of language is common on Wall Street. And that is the problem, and the problem with Rolling Stone’s article as well. Goldman has done plenty wrong, but not much alone. Goldman may have assisted in the dot-com and housing bubbles, but it is wrong to say that it was the single blower. The only thing Goldman is solely at fault for is being a bit better at playing the game than its peers. Also, while many of the advantages Goldman gets are unfair, is it really Goldman’s fault Is it Goldman’s fault that it was able to make billions of dollars with the taxpayers’ dollars it was forced to take as part of the Treasury’s Troubled Asset Relief Program Is it Goldman’s fault that government officials from both parties regularly pick its employees or former employees to fill key regulatory positions Goldman may benefit, but is the firm really to blame. “The [Rolling Stone] article makes a very compelling case against Goldman Sachs, but I think the problems it identifies are pervasive in financial firms and corporate America in general,” says Nell Minow, who is the co-founder of the Corporate Library, a research firm that tracks corporate governance issues. “We need to launch substantive financial reform rather than weighing the faults of one firm versus another.” Minow’s point is this: Spend too much time on Goldman and you miss the fact of how broadly the financial system and the regulations that are supposed to keep profiteers in check failed us. And she’s right.